This Demonstration plots three types of ferns: Barnsley, Thelypteridaceae, and Leptosporangiate. 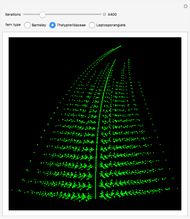 The ferns are obtained by repeatedly applying one of four affine transformations chosen randomly, starting at the origin. 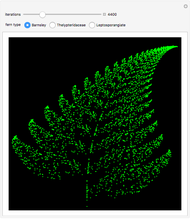 By adjusting matrix coefficients and probabilities, we can generate different types of ferns.